This is a wide-ranging, poetic analysis of the great English poetic line, iambic pentameter, as used by Chaucer, Sidney, Milton, and particularly by Shakespeare. 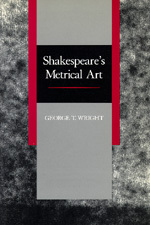 George T. Wright offers a detailed survey of Shakespeare's brilliantly varied metrical keyboard and shows how it augments the expressiveness of his characters' stage language. George T. Wright is Regents' Professor of English at the University of Minnesota and author of The Poet in the Poem and W. H. Auden.